Unire acqua e zucchero e far bollire in un tegame. Combinare con il succo filtrato dei limoni e congelare. Rompere di tanto in tanto il ghiaccio che si va formando, impedendo al liquido di diventare un blocco compatto. Congelare il liquido. Al momento di servire, lasciare ammorbidire a temperatura ambiente e raschiare la granita con un cucchiaio o una forchetta. I puristi storceranno il naso, però secondo me è buona lo stesso. La granita può anche essere preparata nella gelatiera. Combine water and sugar and bring to boil. Combine this syrup with filtered lemon juice and freeze. Mix the granita occasionally to avoid solidifying. Freeze the liquid. To serve, let soften few time and using a tablespoon (or a fork), scrape granita. Granita can be prepared also using a ice cream maker. Lila, Lemon Granita sound so refreshing..I would love one right now on this hot summer day!!! Great photo sweetie!!! xoxo Ciao bella! Lilla this is looking so good and brought some good flavors in my mouth. Sometimes bakers need to chill out - and this recipe looks ideal for that! I will have to spend some more time visiting your last posts - I had to be away from the computer for about three weeks. Hi! 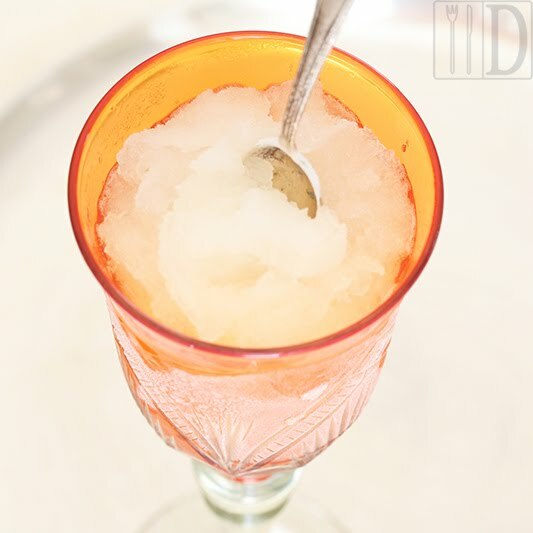 lilla, Looks like a simple summer refreshing granita ! what an enticing photo!buzzzed:). This looks so refreshing... and as many "creative" granitas as I've made in the past few months, my favorite is still lemon! Thanks for sharing! Cara Lilla-Tali ricordi della Sicilia, questo delizioso e rinfrescante granita al limone mi porta!